We have several sets of old shutters in the store, and I got to thinking (I know – that is dangerous). How can I creatively use a couple of them? Yes, we all love them painted and shabby, but what else can we do with them? Here you go! This would be adorable as a side table next to the bed or a little extra storage in the bathroom, or on the counter in the kitchen. It would look so cute with plants, colorful vintage cooking utensils, or a couple of recipe books and a recipe box. The possibilities are limitless! 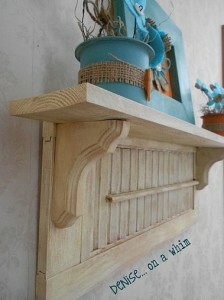 This adorable shelf would look great in the laundry room, entry way, or even the bedroom. 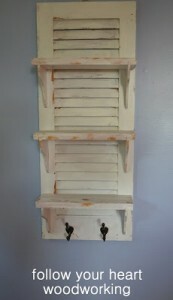 Add a few old door knobs and you have a coat rack! What a cute way to add storage in a small bathroom to store towels, toiletries, or just a plant or two! 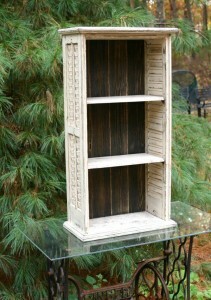 Would love to see how you have re-purposed old shutters in your home!